Bringing together a thousand islands in the middle of the Indian Ocean, the Maldives are undoubtedly part of these land-based paradises. 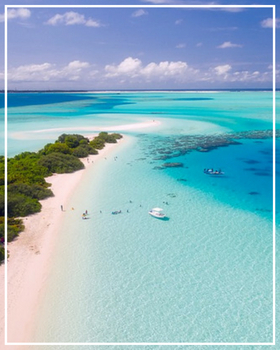 Sandy beaches, crystal clear sea, luxurious nature...the Maldives are adorned with a palette of landscapes that promise an absolute change of scenery. Enjoy one of our most beautiful villas for rent in the Maldives and discover all the charm these little pearls of the Indian Ocean hold. The Maldives form an undeniably breathtaking set of islands when one escapes their natural environment. Around each island, the sea appears so splendid and translucent that it gives you a refreshing swim. In addition, the richness of the seabed of this part of the Indian Ocean adds a hint of magic to the Maldives. You will undoubtedly experience your most beautiful vacation in these charming countries! You will not have time to get bored because the Maldives have a thousand ways to entertain you. Various nautical recreation will delight the sportsmen. After stimulating jet-skiing, surfing, kayaking and windsurfing, join the beach for a pleasant lie down. But, obviously, scuba diving and snorkeling are among the most popular activities in the Maldives. To this must be added the pleasure of sailing combined with the practice of sport fishing. Then join the islands of Haa Alifu, Baa and Raa. Exploring the coral reefs around these atolls provides absolute beauty. Do not forget your camera to capture every moment under water. You will be able to preserve this magical moment in the middle of the manta rays and whale sharks. On your return from your escapes at sea, enjoy a pleasant picnic on the beach and delight your taste buds with some grilled fish and lobster. For holidays in the Maldives are also equal to moments of relaxation in a relaxing environment. In your private villa, enjoy baths with essential oils. Pamper yourself with a good massage and spa session before taking a dip in your private pool.